This issue features two stories by John Broome the first of which features the return of Abra Kadabra who would have better served the issue by being featured on the cover. AK once again returns from the future seeking recognition and applause, and, when he doesn’t get it at a magicians convention that he crashes and is outed as instead as a law breaker, he turns everyone there into a thief. The Flash figures out what has happened, but then he himself is affected by AK and finally breaks free by force of will after which he hops on the cosmic treadmill and returns the magical miscreant to the future where authorities there assure the Flash that he’ll never escape again. Uh, huh. The second story is pretty much an exercise in justifying the Schwartz gimmick cover. 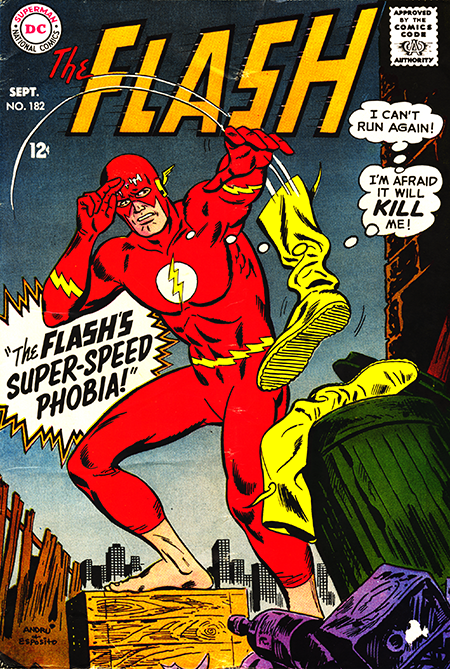 The Flash hits his head foiling a bank robbery and proceeds to get dizzy spells when he tries to use his super speed. So he has to stop the crooks with brawn and guile instead. It’s a good serviceable Broome story in the service of a tired premise. I’d say that it doesn’t matter because it sells comic books, but it wasn’t doing that. Marvel was rapidly gaining ground on DC at that point, and the numbers on the Flash (as well as most of DC’s other books) were slipping into an ominous decline with DC pretty much clueless as to why it was happening. The Flash-Grams page features offerings from two future comics pros Carl Gafford and Mark Evanier. Evanier rips an earlier issue’s offering by fellow letters page graduate Cary Bates. Apparently there’s not much love or loyalty amongst the Flash letter hacks. Luckily, comics fandom would outgrow their immaturity and everyone would opt for the golden rule going forward. Ha, ha, ha, ha, ha, ha, ha, ha, ha, ha, ha, ha, ha, hoo!